For open source projects I'm involved with, I developed the habit to define and document the steady growing amount of repository and build utilities via Composer scripts. Having Composer scripts available makes it trivial to define aliases or shortcuts for complex and hard to remember CLI calls. It also lowers the barrier for contributors to start using these tools while helping out with fixing bugs or providing new features. Finally they're also simplifying build scripts by stashing away complexity. If you've already defined or worked with Composer scripts or even their npm equivalents you can skip this section, otherwise the next code snippet allows you to study how to define these. The here defined Composer scripts range from simple CLI commands with set options (e.g. the test-with-coverage script) to more complex build utility tools (i.e. the application-version-guard script) which are extracted into specific CLI commands to avoid cluttering up the composer.json or even the .travis.yml. Since Composer 1.6.0 it's possible to set custom script descriptions via the scripts-descriptions element like shown next. It's to point out here that the name of a description has to match the name of a defined custom Composer script to be recognised at runtime. On another note it's to mention that the description should be worded in simple present to align with the other Composer command descriptions. "application-version-guard": "Checks that the application version matches the given Git tag." Now when running $ composer via the terminal the descriptions of defined custom scripts will show up sorted in into the list of available commands, which makes it very hard to spot the Composer scripts of the package at hand. Luckily Composer scripts can also be namespaced. To namespace (i.e. some-namespace) the custom Composer scripts for any given package define the script names with a namespace prefix as shown next. As the chances are very high that you will be using the one or other Composer script several times, while working on the package, it's recommended to use a short namespace like in the range from two to four characters. Now this time when running $ composer via the terminal the defined custom scripts will show up in the list of available commands in a namespaced manner giving an immediate overview of the available Composer script of the package at hand. some-namespace:application-version-guard  Checks that the application version matches the given Git tag. some-namespace:configure-commit-template  Configures a local commit message template. some-namespace:cs-fix                     Fixes coding standard violations. some-namespace:cs-lint                    Checks for coding standard violations. some-namespace:test-with-coverage         Runs all tests and measures code coverage. To use any namespaced Composer script, e.g. to fix coding standard violations after a substantial refactoring, it has to be called with its namespace e.g.$ composer some-namespace:cs-fix, which is the one disadavantage of Composer script namespacing. First the assertion message produced by the failing test, see the console output below, got me thinking it might be caused by different encodings and line endings; though the project was utilising an .editorconfig from the early start and the related files were all encoded correctly and had the configured line endings. The Git configuration e.g. core.autocrlf=input also was as it should be. #Warning: Strings contain different line endings! Another deeper look at the CommandTester class yielded that it’s possible to disable the command output decoration and also to normalise the command output. So a change of the SUT preparation and a normalisation of the console output, visualised via a git diff -U10, brought the solution for this particular test. Since the SUT had a lot of integration test for its CLI commands, the lazy me took the shortcut to extend the CommandTester and using it, with desired defaults set, instead of changing all of the related command instantiations. * Gets the display returned by the last execution of the command. So it's a yay for green CLI command integration tests on Windows from here on. Another measure for the SUT would be to enable Continuous Integration on a Windows system via AppVeyor, but that’s a task for another commit 85bdf22. After having refactored several Travis CI configuration files over the last weeks, this post will provide eight adjustments or patterns immediately applicable for faster, changeable, and economic builds. The first one is a simple configuration addition with a positive impact on the time and disk space consumption, which should be quite noticeable on larger code bases. Having this configured will enable shallow clones of the Git repository and reduce the clone depth from 50 to 2. The second one is also a simple configuration addition for caching the Composer dependencies of the system under build (SUB) or its result of static code analysis. Generally have a look if your used tools allow caching and if so cache away. This one deserves a shout out to @localheinz for teaching me about this one. The next shown configuration excerpt assumes that you lint coding standard compliance with the PHP Coding Standards Fixer in version 2.0.0-alpha and have enable caching in its .php_cs configuration. This one might be a tad controversial, but after having had the joys of merging GitHub pull requests from a master branch I started to fail builds not coming from feature or topic branch with the next shown bash script. It's residing in an external bash script to avoid the risk of terminating the build process. The bash script could be extended to fail pull requests not following a branch naming scheme, e.g. feature- for feature additions or fix- for bug fixes, by evaluating the branch name. If this is a requirement for your builds you should also look into the blocklisting branches feature of Travis CI. With configuring the PHP versions to build against in a matrix include it's much easier to inject enviroment variables and therewith configure the version specific build steps. You can even set multiple enviroment variables like done on the 7.0 version. I don't know if enviroment variable injection is also possible with the minimalistic way to define the PHP versions list, so you should take that adjustment with a grain of salt. It also seems like I stumbled upon a Travis CI bug where the global enviroment variable OPCODE_CACHE is lost, so add another grain of salt. To work around that possible bug the relevant configuration has to look like this, which sadly adds some duplication and might be unsuitable when dealing with a large amount of environment variables. This one is for reducing the build duration and load by avoiding unnecessary build step repetition. It's achived by linting against coding standard violations or generating the code coverage for just a single PHP version per build, in most cases it will be the same for 5.6 or 7.0. This one is also for reducing the build duration and load by targeting the analysis and checks on tagged release builds. For example if you want to ensure that your CLI binary version, the one produced via the --version option, matches the Git repository version tag run this check only on tagged builds. For catching breaking changes in interfaces or API's beyond your control it makes sense do run integration tests against them once in a while, but not on every single build, like shown in the next Travis CI configuration excerpt which runs the integration tests on every 50th build. The last one is all about improving the readability of the Travis CI configuration by extracting command configurations i.e. options into dedicated Composer scripts. This way the commands are also available during your development activitives and not hidden away in the .travis.yml file. "cs-lint": "php-cs-fixer fix --diff --verbose --dry-run"
To ensure you don't end up with an invalid Travis CI configuration, which might be accidently committed, you can use composer-travis-lint a simple Composer script linting the .travis.yml with the help of the Travis CI API. While contributing to Construct, maintained by Jonathan Torres, I gathered some insights and learnings on the characteristics of a dope PHP package repository. This post summarises and illustrates these, so that PHP package develeopers have a complementary guideline to improve existing or imminent package repositories. Jonathan Reinink did a good job in putting the PHP package checklist out there which provides an incomplete, but solid quality checklist for open-source PHP packages. I'll distill the characteristics of a dope PHP package repository by looking at the repository artifacts Construct can generate for you when starting the development of a new PHP project or micro-package. The following tree command output shows most of the elements this post will touch upon. The artifacts in parenthese are optional and configurable from Construct but can nonetheless have an import impact on the overall package quality. > Clean code is code that is written by someone who cares. > A dope PHP package repository is one that is created and maintained by someone who cares. The next shown pyramid illustrates the three main categories the artifacts of a package repository will fall into. First and most important there's the main sourcecode, it's tests or specs, and the documentation which could be dependent on it's size reside in a README.md section or inside a dedicated docs directory. Using a docs directory also allows publishing the documentation via GitHub pages. Other aspects of a package which should be documented are the chosen license, how to contribute to the package, possibly a code of conduct to comply with, and the changes made over the lifespan of the package. Second there's the configuration for a myriad of tools like Git, GitHub, EditorConfig, Composer, the preferred testing framework, the preferred continuous inspection / integration platform such like Scrutinizer or Travis CI, and so forth. The final category includes tools which ease the life of maintainers and potential contributors equally. These tools can be helpful for releasing new versions, enforcing coding standard compliance, or commit message quality and consistency. All sourcecode and accompanying tests or specs should follow a coding standard (PSR-2) and have a consistent formatting style, there's nothing new here. The perfect place to communicate such requirements is the CONTRIBUTING.md file. Tools like PHP Coding Standards Fixer or PHP_CodeSniffer in combination with a present configuration .php_cs|ruleset.xml.dist and a command wrapping Composer script are an ideal match to ease compliance. The Composer script cs-fix shown next will be available for maintainers and contributors alike. "cs-fix": "php-cs-fixer fix . -vv || true"
Consistent formatting styles like line endings, indentation style, and file encoding can be configured via an EditorConfig configuration residing in .editorconfig which will be used when supported by the IDE or text editor of choice. I would favour the later one anytime for it's much easier reading flow and pattern matchableness. The easier reading flow is achieved by the upper casing of the *.md files which also clearly communicates their documentation character. The configuration files for tools which except the .dist file extension per default should all have such one like shown next. Next to the package's changelog, incrementally growing in the CHANGELOG.md file, the Git commit messages are an important source of change communication. Therefor they should also follow a consistent format which improves the reading flow while also leaving a professional impression. This format can be documented once again in the CONTRIBUTING.md file or even better be provided via a .gitmessage file residing in the package's Git repository. Once more a Composer script, named configure-commit-template here, can ease configuration and if configured Git will use it's content when committing without the -m|--message and -F|--file option. "configure-commit-template": "git config --add commit.template .gitmessage"
To enforce commit message formatting adherence to the rules described by Chris Beams on a Git hook level, the git-lint-validators utility by Billie Thompson can be helpful. Release versions should follow the semantic versioning specification aka SemVer, once again there's nothing new here. When using version numbers in the sourcecode or CLI binaries, these should be in sync with the set Git tag. Tools like RMT or self-written tools should be utilised for this mundane task. The next shown code illustrates such a simple self-written tool named application-version. It's main purpose is to set the provided version number in the CLI application's binary and avoid an application version and Git tag mismatch. * Return the application version. * @param  string $binFile File holding the application version. * Return latest tagged version. The application-version tool could further be utilised in Travis CI builds, to avoid the earlier mentioned version differences, like shown in the next .travis.yml diggest. 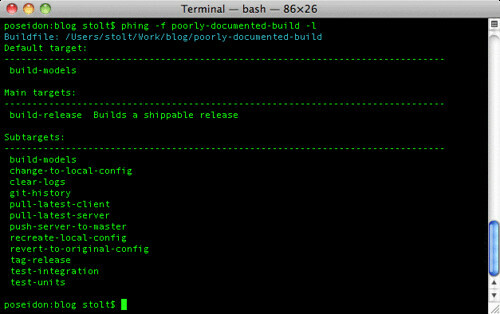 On an application version and Git tag mismatch the shown build script will break the build early. To speed up continuous integration builds, resource and time consuming extensions like Xdebug should be disabled when not required for measuring code coverage. The next shown before_script, tailored for Travis CI, is generated by Construct per default and might shave off a few build seconds and thereby provide a faster feedback. To reduce email traffic, the email notifications send by Travis CI should be reduced to a minimum like shown next, or dependent on your workflow the could be disabled at all. Something I really would love to be supported by Travis CI is a feature to ignore a set of definable artifacts which could be configured in a .buildignore file or the like. This way wording or spelling changes on non build relevant artifacts like the README.md wouldn't trigger a build and misspend resources and energy. There's a related GitHub issue and here's hope it will be revisited in the near future. To keep releases (or dists in Composer lingo) of PHP projects or micro-packages as lean as possible, their repositories should contain a complete and valid .gitattributes file. With such a file present all export-ignored files will be excluded from release archives and thereby save a significant amount of bandwith and energy. The next code shows the content of such a .gitattributes file excluding non release relevant files like internal tools, configuration, and documentation artifacts. If for some reasons you require the complete source of a PHP project or micro-package you can bypass the default by using Composer's --prefer-source option. To validate the .gitattributes file of a PHP project or micro-package on the repository, Git HEAD, or build level the LeanPackageValidator CLI can be helpful. Badges, if used sparsely, are a handy tool for visualising some of the repository properties. It's definitely nice to immediately see the required PHP version, the current build status, or the latest version of the package as they save you manual look ups. Badges showing the amount of downloads, code coverage, or the chosen license are in my opinion kind of poserish, they cause unnecessary requests to the badge service, and are in case of the license even obsolete. Why should you care about the dopeness of a PHP package repository? Creating and maintaining a dope PHP package repository might have a positive impact on several levels. It can earn you some valuable Brownie points or even provide a conversation gambit when doing job interviews, simply because you showcase professionalism. Furthermore it's more likely to get valuable and high quality contributions from your second target audience when supportive documentation and tooling for things like issue creation, coding standards compliance, or Git commit message consistency are available. It also might convince an end user, your main target audience, in using your package over a competitive one. So these were my recent insights and learnings on the anatomy of a dope PHP package repository. If you'r lucky to be attending this year's ZendCon, I recommend to catch Matthew Weier O'Phinney's session about Creating PHPantastic packages. I definitely be waiting for the related slides.